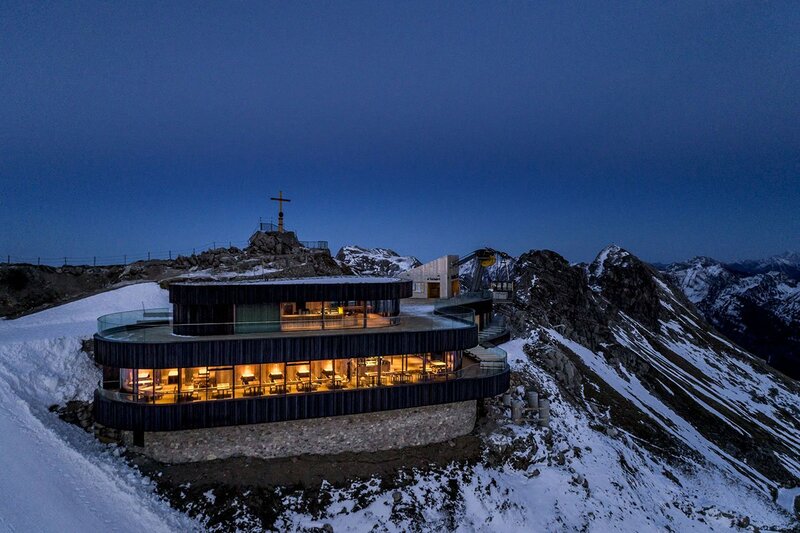 Located at an altitude of more than 2,200 metres atop Mount Nebelhorn in southern Germany, a privileged location with panoramic views over the Bavarian Alps, the new Nebelhorn Summit Restaurant by Austrian architectural practice Hermann Kaufmann ZT is harmoniously integrated into its natural surroundings. 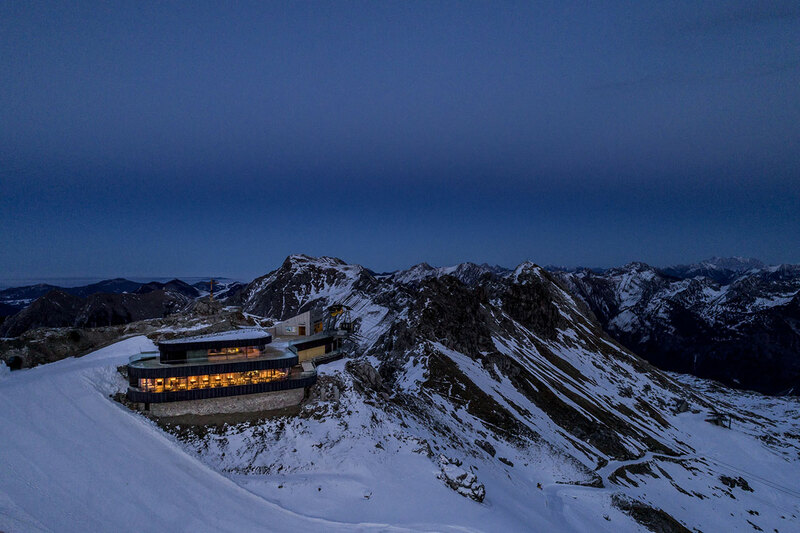 Offering gastronomic delights and spectacular views, the restaurant sees an alpine aesthetic of timber exuberance artfully combined with a modernist sensibility of minimalist elegance. Reached by the Nebelhorn Cable Car that has been transporting visitors up the mountain since 1930, at the time the longest cable car ride in the world, the new restaurant replaces an outdated chalet from the 1950s that obscured the view of the mountain peak from the valley and even blocked it from the cable cabins. 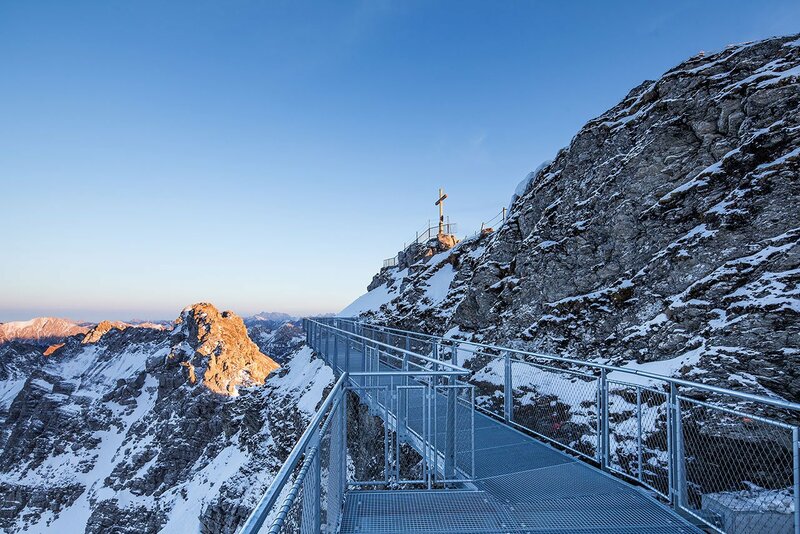 Thus in order to “liberate the summit”, which is crowned by a five meter high wooden cross, and “bring it into the centre of attention”, as the architects summarized their goal, the new structure was moved slightly down the mountain slope and away from the cable car station whilst also being made smaller in size. 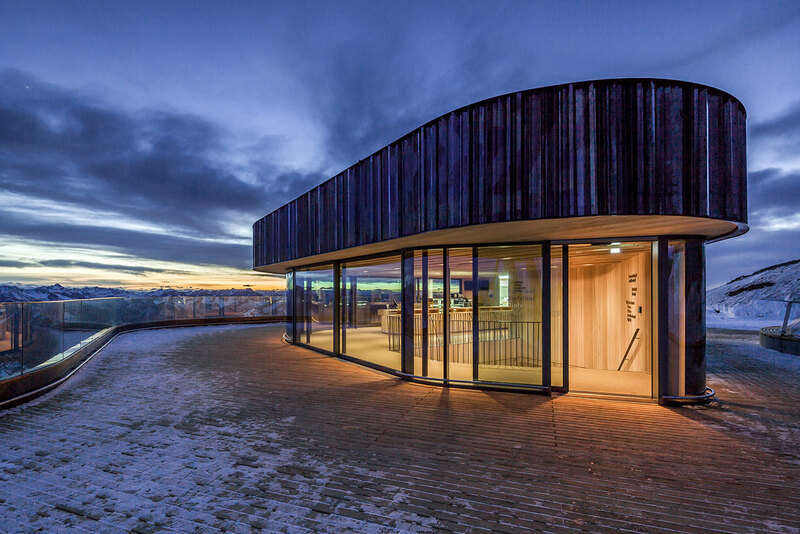 The architectural design crucially eschews the traditional chalet A-frame typology, choosing instead an organic form that follows the mountain’s contours firmly integrating the new building into the topography. 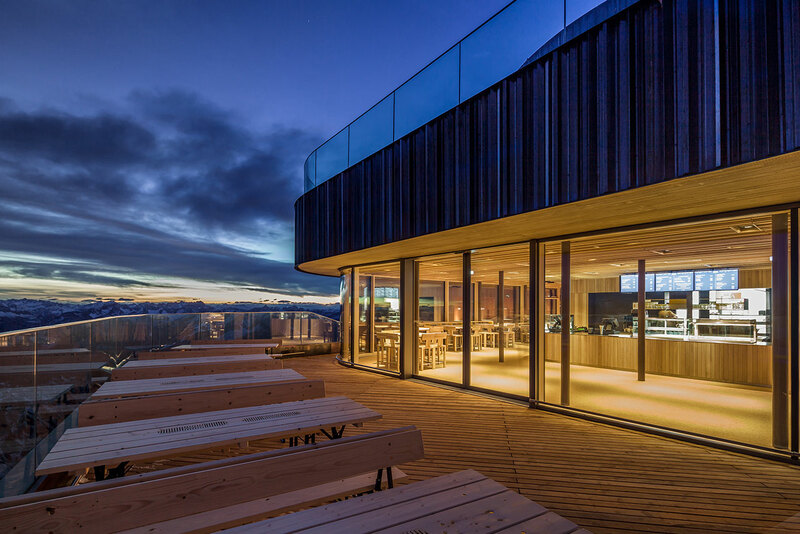 This approach also made it possible to smoothly incorporate the parts of the existing structure that were worth preserving, namely the massive concrete remainder of a former chair lift station that now serves as the new restaurant’s foundations. As the building materials had to be flown by helicopter to the site, a timber frame construction was selected to minimize weight and helicopter flights while the required ready-mixed concrete had to be specially formulated to delay the hardening up to six hours. Complicating the building’s construction even further, the cable car’s operation was not to be interrupted during the demolition and erection of the new structure. Exiting the cable station after a 20 minute ride, visitors are led along a viewing terrace to a small pavilion that marks the restaurant’s entrance and serves as an intimate bar and bistro. Unlike the old configuration, the restaurant itself, which also includes a dining terrace, is located on the lower floor, reached via a wide staircase or by lift. 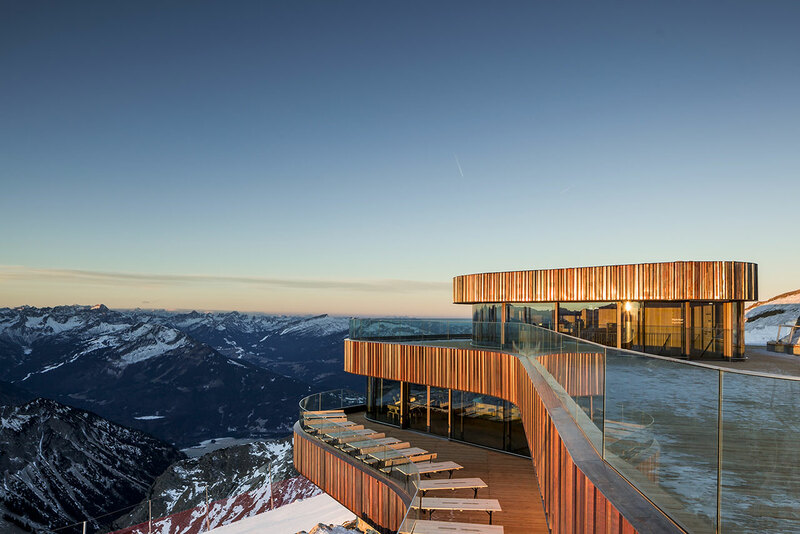 Both the bar and the restaurant levels feature floor-to-ceiling glazing that wraps around the spaces offering uninterrupted views made all the more impressive by the glass balustrades. Clad in timber strips, the building thus appears as a composition of alternating curvilinear bands of glass and timber, supported by a stone-clad sub-basement level that contains technical spaces. 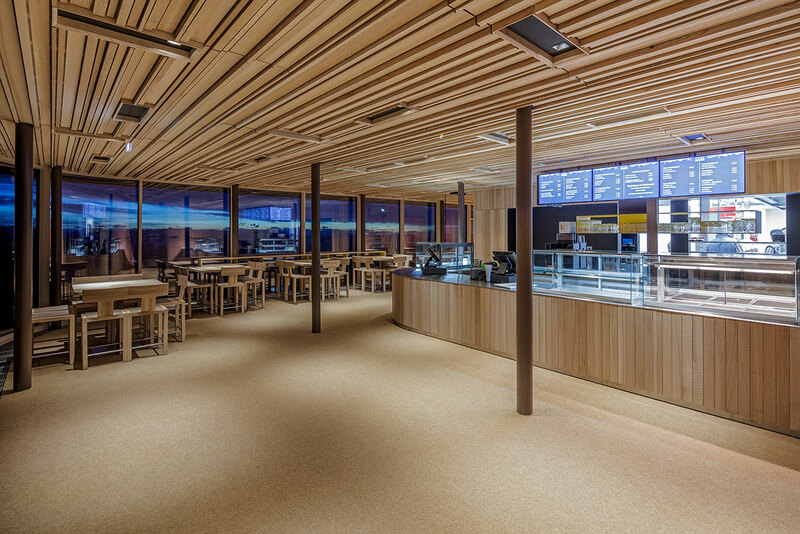 Making the optimum use of both its constructive and creative potential, timber has also been extensively used for the building’s interiors. 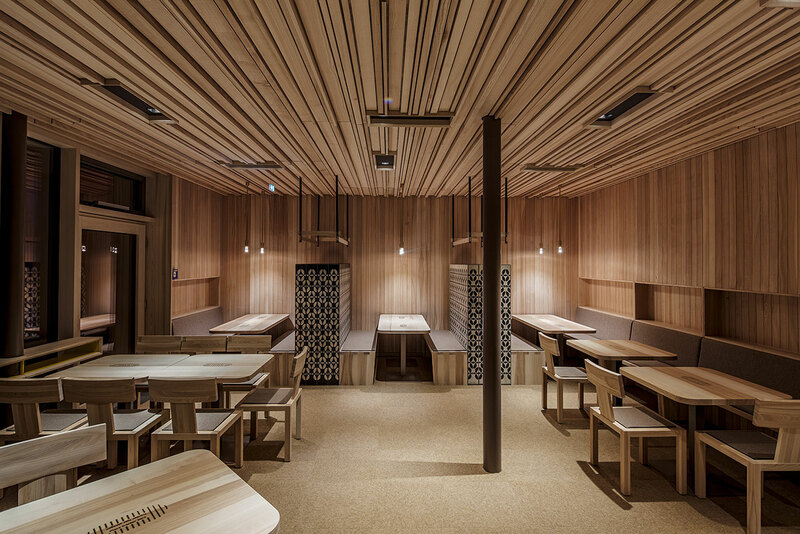 As with the exterior, timber strips have been used to clad the restaurant and bar’s surfaces. 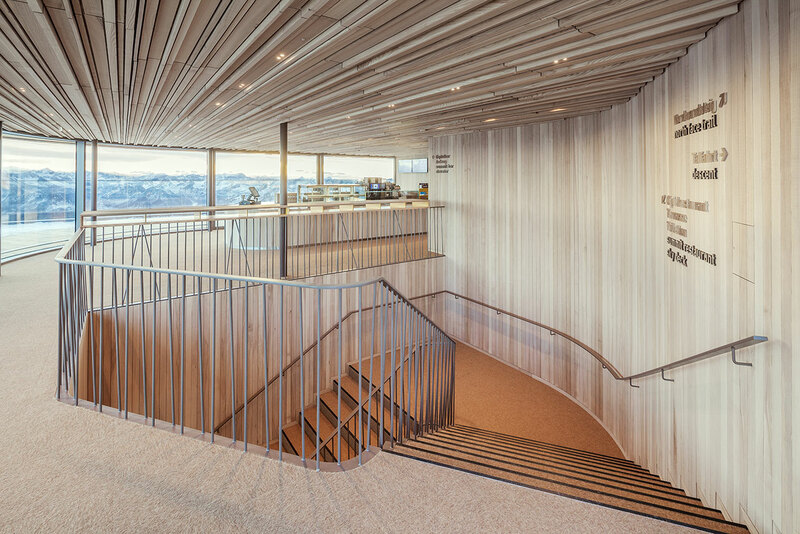 For the walls, the design called for orderliness and smoothness whereas a more inventive approach has been followed for the striated ceilings with wooden strips of varying width and extrusion creating a rugged landscape that perfectly complements the jagged mountainous scenography outside. The same natural textures are used for the wooden tables and chairs that exhibit a Scandinavian modernism of simple, clean lines and slender geometric shapes. 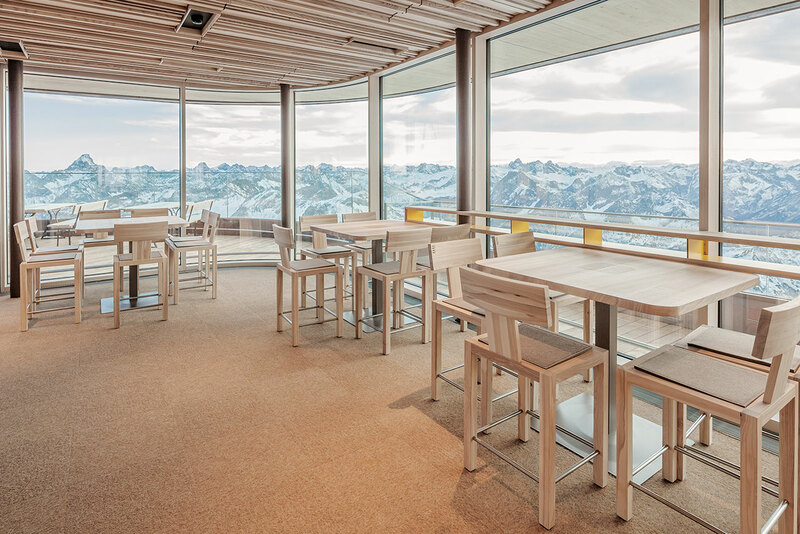 Complemented by a new 100 metre long grated steel walkway that rings the entire summit allowing visitors to access the north face of the mountain for the first time, the new Nebelhorn Summit Restaurant offers visitors an eclectic choice of alpine treats to quest their hunger along a selection of 400 different summits to feast their eyes.